Aviary’s filters are the talk of the town for many mobile app developers. Twitter is a customer, and so are Flickr and even Walmart. With apps jumping on board to offer its users a filter, close enough to meet user expectations influenced by Instagram (albeit not quite there), the company announced that a combined 35 million users have so far edited over three billion photos using Aviary’s filters. Really thanks to Instagram, easy photo editing has become a big deal and almost an expectation from any social photo sharing platform. Starting with its roots as a Web-based photo editing tool for consumers, the company eventually shifted its efforts to delve into mobile 18 months ago with a new B2B business model. If you’re familiar with the hockey stick projections, a common sight in business plans, we all know that it’s a silly (although sometimes necessary) formality due to how unrealistic the graphs tend to be. But based on a graph that Aviary released alongside the announcement, its business model selling Aviary’s SDK to interested parties really has shot up its usage like a hockey stick. In the first year of the SDK’s release with 30 partners, starting September 2011, the company reached one billion photo edits and celebrated its SDK’s first birthday with a total of 1,000 partners. In the last six months alone, Aviary has really been taking off. The company announced that it now has a total of 3,500 partners for an additional two billion photo edits during these six months, up from one billion around October 2012. 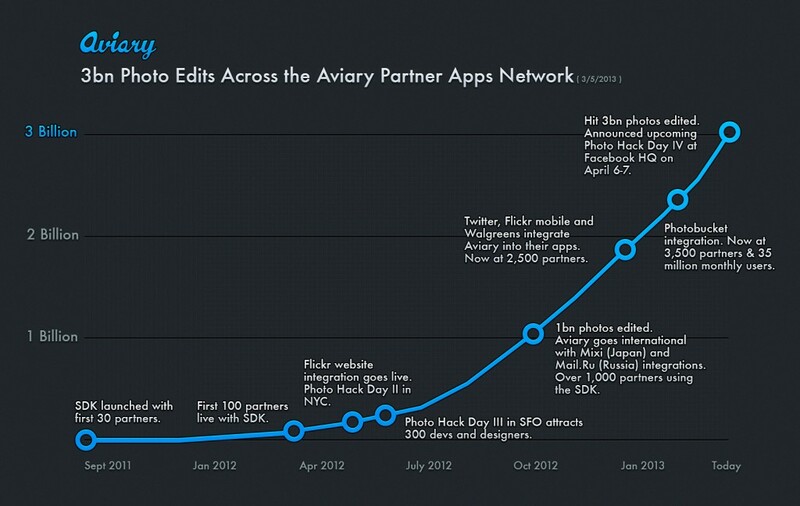 To put the scope of Aviary’s usage into perspective, users have collectively spent 3,804 years editing photos. Aviary has a clear agenda. “Supporting ever more developer partners, and their users, remains our primary focus,” says Peggs. But its successes are contingent on user interest in photo sharing and running photos through filters. With Vine and other video sharing apps starting to take center stage, video just might turn out to be the new phenomenon.